Before I went on holiday I was sent some gorgeous samples of the '5 Free' natural nail polish brand HJ Manicure. I'd never heard of the brand before but I love discovering new brands and after checking out the website I was very eager to give them a try! 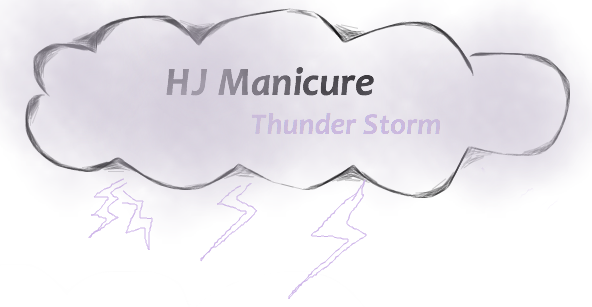 I chose two colours, Tropical Sunset* (from the Holiday Collection) and Thunder Storm* (from the HJ Signature collection). Today I want to focus on the heavenly shade Thunder Storm! Thunder Storm is a sultry, dusky grey toned lilac and I fell in love with the colour straight from the website. If I could only choose one colour, it would be this. It is soo soft and gentle looking, dusky without looking bland and dull. Just beautiful! I have to be honest when I first applied the polish I thought the formula was very runny and worried that combined with my terrible nail painting skills it would be thin and streaky. But no, you soon realise that the formula is thin but this actually means that is seems to settle perfectly on the nail with literally no streaking at all! I think the long narrow brush really helps with precision too. The fluidity of the polish certainly doesn't compromise the cover either, one coat is perfectly opaque and as I said no streaks and completely patch free. Being so fluid makes it mega easy to apply and fast too. Talking of fast, this polish dries really well and speedily without getting sticky and tacky which for a cultz like me is a bonus (no more finger prints on my nails!) Like I said you can happily get by with one coat but two coats really gives it that extra summin' summon'. The finish is smooth and has a beautiful gloss and shine to it that really helps enhance the colour! As for durability, well i tested these polishes on holiday and at home and with a top coat they stood the test of Sun, Sand, Sea, Swimming (chlorine and salt), Showers and the nibblings of a teething 8 month old. They lasted through multiple hair washes and washing up and wear and tare started shooing on the tips at about day 3 and proper chipping after about day 5! I think that's pretty good going for a natural nail polish brand. Of course these nail polishes are toxic free. Free from all the top nail polish nasties including Formaldehyde, Formaldehyde Resin, Toulene, DBP (Di-butyl phthalate) and Camphor. They are also free from Animal Derivatives and so are Vegan and also cruelty free! Oh I totally adore this colour it's so unique and feminine, I'm generally obssesed with pastel colours so this is perfect!